OSAT May Blog Hop – Clean & Simple! Home / Blog / OSAT May Blog Hop – Clean & Simple! Happy Thursday to you all! I had another relatively productive day yesterday. I went to the Store in the morning and visited with Renee for a bit. After that I went to my Parent’s to see little Daniel and Tristan. They were over so that Erika could study for her Chemistry final. After that back to my house to work on some projects, some dinner with my Mum and Dad and then Taylor came by and we watched a few episodes of Blindspot, I’m happy to report that I’m all caught up! I have a bunch of projects to get finished and who know what else?! For my projects today I’m participating in a blog hop with a bunch of my friends from one of the Facebook groups that I belong to. It’s called One Stamp at a Time Cards and More. If you have arrived here from the clever Lori Mueller’s blog, welcome! This month we have a Clean & Simple theme! I love a nice clean, simple card especially lately! And when you can use just one set and some ink even better! All of the four cards use a card base of Neenah Solar White 110lb Card Stock. I used the Concord & 9th Enjoy it All Photopolymer Stamp Set to stamp all of my images and greetings in Lawn Fawn Ballet Slippers, Fresh Lavender, Peachy Keen, Minty Fresh, Sunflower, Juice Box, Carrot, Sugarplum, Jalapeño and Black Licorice. The greetings are stamped using my Mini MISTI and the rest of the images with blocks. That’s it! Some nice quick, clean, crisp and simple cards! 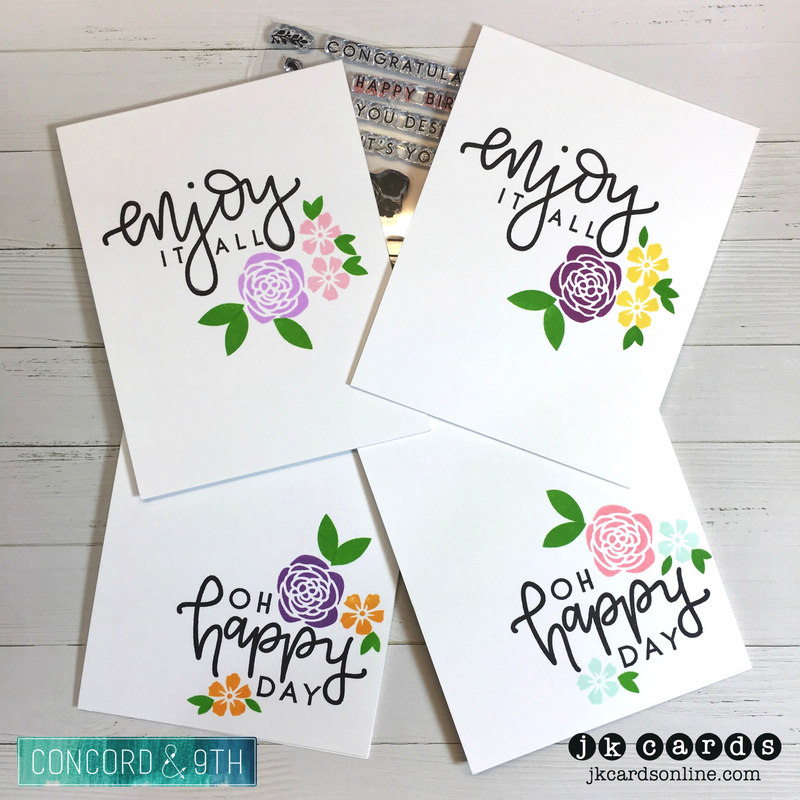 I do love a stamp set from Concord & 9th, they are one of my favorite companies, they have fun and innovative products that make projects great! This entry was posted in Blog, Cards, Concord & 9th, Crafts, Lawn Fawn, OSAT Blog Tour, Photopolymer, Stamps and tagged Card Making, Concord & 9th, Crafts, Lawn Fawn, OSAT Blog Tour. Bookmark the permalink. I love the large greeting and the pretty flowers with lots of white space. So pretty. Have a great day! Stunning cards, Justin. Clean and simple are always refreshing.